Thermal Fluxes are present everywhere. They are the way in which heat is transferred from one body to another via contact, convection or radiation. Mathematically, Thermal Fluxes are the derivatives of temperature "T" over time "t". This means that you are able to know the the Thermal Fluxes, you are therefore able to predict temperature evolution of a defined medium. 2. Easily integrate the measured thermal flux into a computer regulation. 3.Allow the development of new or improved functionality for regulation and automation based on the heat flux information. ​Our system is composed of one of gSKIN®heat flux sensors which measures heat flux and conveys the measured value to our TP-ALPHA device. The TP-A device then converts the signal into a standard signal for any industrial or home computer system. Therefore, our TP-A device has three standard output interfaces: +/- 10V, 4-20 mA and RS485. 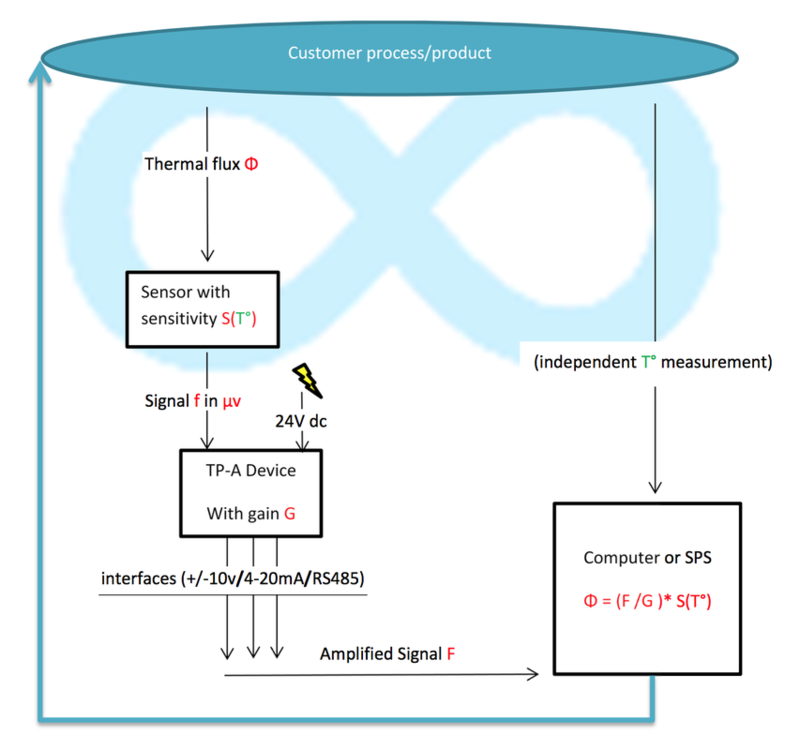 The signal is sent to the computer SPS-system where it can be used as an input to real time thermal flux calculation and further uses. A full regulation system can be composed of several heat flux sensors sets in parallel. The sensor is composed of a sensor head to measure heat fluxes, a cable to transfer measured data, and a standing plug. Upon request, customer-specific sensor configurations are available ( without cable, with different head geometry of material or specific plug). Composed of anIP 57 box, a sensor plug and DC input + output plug. The device runs on a current input of 100mA, 24 V DC (+/-10%). ​The Device Contains the signal filtering and amplifying system. Each TP-A device has a Specific measured amplification value which must be calibrated annually. TP-A device plug for DC input and output of amplified signal. We can provide computer or SPS interface delivering the amplified output current value of the sensor. Interface possibilities are RS485, +/-10 V (or 0-10 V), 4-20 mA. Interfaces technical specifications are included in document B6-spec interfaces. We provide two daily usable exe programs, to have an easy visualisation of the thermal flux for testing purposes. The Labview VI.exe provides a measured value corrected for T° impact, while out Wintest Program (C++) provides a real time value for the thermal flux or μV values or Isb values. Wintest is a C++ based interface, it includes an automatic TP-A device detection and configuration tool for CPU communication. In order to calculate the converted value in W/m2, the sensor sensitivity an amplification value have to be input in the system. *Wintest Program Does not correct the sensor sensitivity over temperature in its standard version.